LOPE DE VEGA (IRE) (Chestnut 2007-Stud 2011). 4 wins-2 at 2, Chantilly Prix du Jockey Club, Gr.1. Sire of 452 rnrs, 287 wnrs, 37 SW, inc. Belardo (Newmarket Dewhurst S., Gr.1), Vega Magic, The Right Man, Santa Ana Lane, Capla Temptress, Jemayel, Very Special, Hero Look, Endless Drama, Spanish Reef, Spanish Whisper, French Fern, Candy Store, Steel of Madrid - Calderon (Aust. ), Soustraction, Navarra King, South Seas, Blue de Vega, Burnt Sugar, etc. ALL BLACK MISS, by Black Hawk. 5 wins from 1300m to 1750m, A$86,960, 2d AJC Malabar H., 3d AJC Bronte H., Australia Day at Randwick H., Rose Bay H., STC Theraces.com.au H., Grey Gums Hotel Penrith H., Members H. Dam of three foals, two to race. All Black Miss. 5 wins. See above. Pantheon. 4 wins from 1600m to 2100m, 3d MVRC Saj Cater Care Group P.
Battles. Winner at 1200m, 3d ATC Royal Randwick on Facebook H.
Java Spirit. 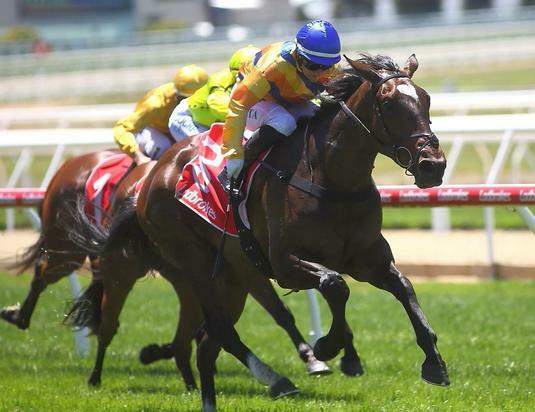 2 wins at 1350m, 1400m in Aust. Riri. Winner at 1600m in Aust. VIZ VITAE (Shinko King). 12 wins from 1600m to 3200m, NZ$216,525, A$187,870, Marton Cup, L, Benalla Gold Cup, Bay of Plenty Cup, ARC Remuera Cup, Whips 'n' Spurs H., Moonee Valley Hurdle, ARC New Zealand Herald H., Manawatu RC Empire Cobb & Co H., WRC Summer Cup, 2d Wellington Cup, Gr.1, ARC New Zealand Herald H., Oakbank RC McGuinness McDermott Foundation H., VRC BR Smith Hurdle, Waikato RC Te Atatu Farm H., 3d SAJC John D Lee S., L, ARC Whips n Spurs H.
Java Siang (Desert Sun). 4 wins. See above. Mexican Lass. 4 wins at 1400m, WATC Perthracing.com.au H., Support Your Industry H., 3d WATC Key Business H.
Passion Cantata (Oratorio). 6 wins-1 at 2-to 1500m, A$311,967, WATC Bulmers H., Playeronline.com.au H., Westspeed 2YO P., Happy 70th Birthday Tony Oreb H., Melbourne Cup Packages Book Now H., Westspeed H., 2d WATC Tabtouch Supporting WA Racing H., Westspeed H., Perth Ice Works H., 3d WATC Sir Ernest Lee-Steere Classic, Gr.3, Westspeed Nursery H., Westspeed 3YO H.
Our Partner (Take Your Partner). 5 wins-2 at 2-to 1500m, BTC Treasury Casino H., QTC All Our Mob H., Catholic Church Insurance H., 2d GCTC Ken Russell Classic H., L, QTC Dux Super Hot Water H., Rinnai Infinity H., 3d QTC One Guinea H.
Mi Tristena (Sir Tristram). 5 wins. See above.